According to the latest research report of global brand value consultancy Brand Finance, Amazon’s brand value surpassed Apple in 2018-2019, becoming the No. 1 in corporate value in the US, and Netflix became the fastest growing US company in the period. Brand Finance pointed out in the report that Amazon’s brand value increased by 25% from 2018 to 2019, reaching $187.9 billion. This was followed by Apple’s $153.6 billion, Google’s $142.8 billion, Microsoft’s $119.6 billion, and AT&T’s $87 billion, respectively, fourth and fifth. In addition to the top 5 companies, Facebook ranked sixth with a brand value of $83.2 billion. According to the report, despite the impact of the privacy scandal, Facebook’s brand value is still 8.7% higher than 2017. As for Disney, Disney is the most valuable brand among traditional media companies, ranking 10th in the overall ranking. This is because Disney’s brand value has grown 40% to $45.7 billion after the acquisition of 21st Century Fox. In addition to the top 10 list, there are other companies worthy of attention, including Google’s YouTube, which has become a strong and fast-growing brand from 2018 to 2019. The company’s brand value grew 46% to $37.8 billion, up 10 places from 2017, ranking 13th. In the past, Brand Finance’s corporate brand value list has traditionally been dominated by large companies. Netflix’s brand value ranks 40th in the report between 2018 and 2019, and there is still a long way to go before the top ten most valuable brands in the United States. However, Netflix’s brand value is still up 19 places from 2017, as the value of the brand has doubled during this period, reaching 105% to $21.2 billion. 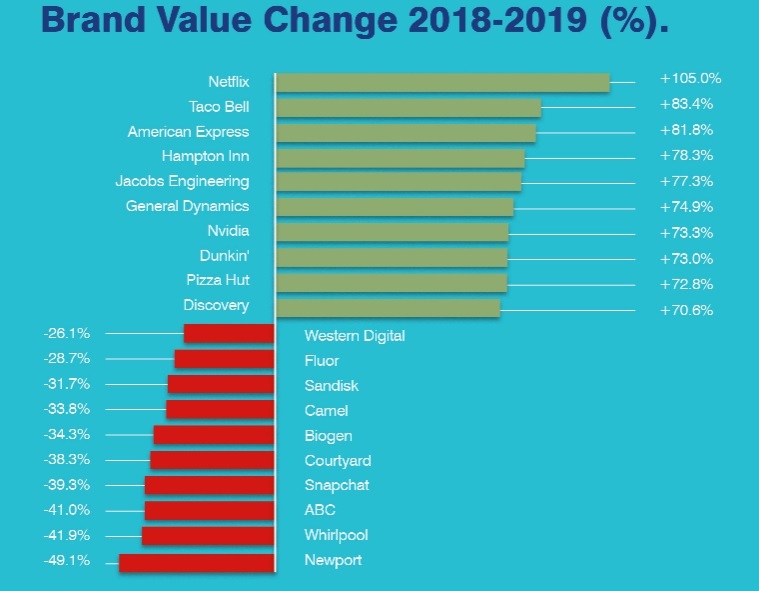 In addition to Netflix, other brands that have achieved significant brand value include Taco Bell (83.4%), American Express (81.8%), Hilton Group (78.3%), Jacobs Engineering (77.3%), General Dynamics (74.9%), and Huida (73.3%), Dunkin’ Donuts (73%), Pizza Hut (72.8%) and Discovery (70.6%). In addition, one of the world’s four largest accounting firms’ diligence is ranked first in Brand Finance’s 2019 brand strength index, with a score of 91.2 in a 100-point rating. Secondly, it is followed by McDonald’s, Intel, Neutrogena and Coca-Cola. According to Brand Finance, the company’s evaluation of corporate brand value is based on the “authorization rule”, which is to judge the value of the brand and the cost of the company’s authorization to use such a brand. The Brand Strength Index uses a set of weighted indicators to measure the results of marketing investments, shareholder equity, and business performance. Next Intel roars Nvidia, is it because of the automatic driving safety model plagiarism?